This traditional six-point sheriff badge is popular with our directors for use on stage because it is a little bit bigger then most of our other sheriff badges but not so over sized that it looks out of place. It can also be used as part of a western sheriff or cowboy Halloween costume when paired up with one of our chaps and vest sets. 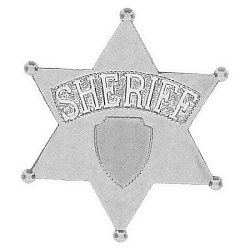 The sheriff badge is made of silver toned plastic with an attached pin and measures 2.5” tall by 2.5” wide.